PuzzleMad: Twisty Solving by Intuition? My recent splurge of puzzle acquisition has been unfortunate in its timing - I have had some very long stressful days at work and have had to work weekends. This coupled with some home stresses meant that I have had less puzzling time than I wished for. Finally, when I did have time, I just didn't have the brain power and energy for anything really complex. Last week I was really pleased to go back to some more basic puzzles - it required less concentration power but was still a pretty good challenge and was really entertaining too. 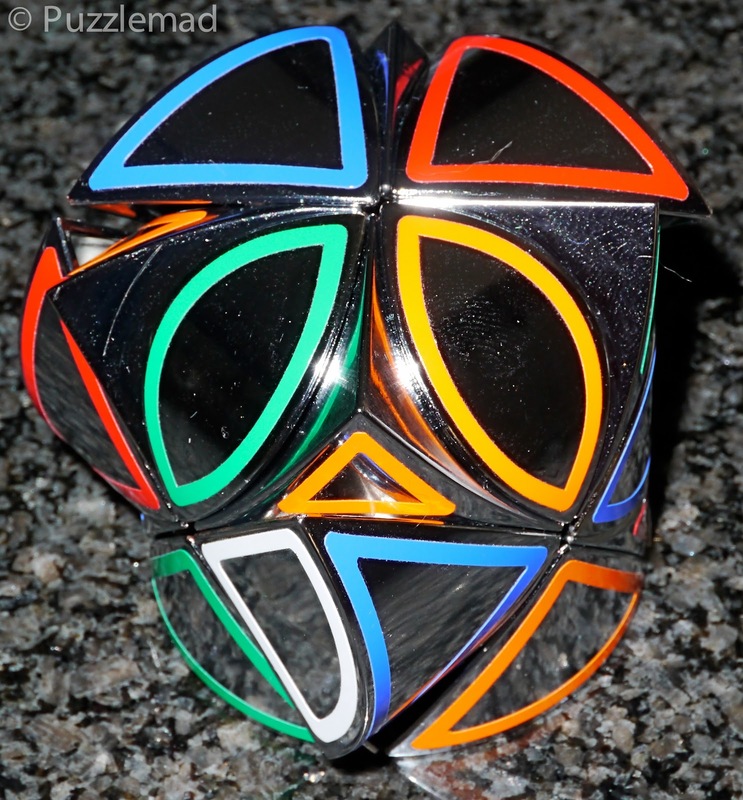 The Bubbloid twisty puzzles were designed by Carl Hoff (whom I got to meet at the London IPP) and ever since I saw his announcement of their design on the Twisty Puzzles forum and after he showed off the 3D printed version, I had coveted them. 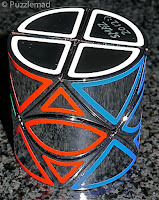 There had been some mention that they solved the same way as the Mosaic cube (and later Oscar's Mosaic cuboid) but I had never managed to acquire either of these and was left to my wistful drooling - I lurve twisty puzzles with different turning mechanisms or different geometries to the usual. Unfortunately the 3D printed versions of these (and Carl's other wonderful designs were just too expensive for me at that time - I had spent rather a lot of money! It was a delightful surprise to find out at the beginning of July that Calvin Fan (of HKNowstore) had teamed up with Carl to facilitate the mass production of 2 of the Bubbloid cuboid series. They were renamed from Carl's original names and I think for the better as it now describes the dimensions rather than just the overlap. Within just a few weeks of the announcement they were up for sale. I bought mine from my good friend Martin who has opened up his own Twisty puzzle on line store in the UK - his prices are excellent and service is superb! If you want to buy the Bubbloids from him then click here. If you live in the Far East then Calvin's HKNowstore is a good bet. This week I got quite stuck on some more of Wil's disentanglement puzzles and hence I decided to make a start on the new and beautiful twisties. 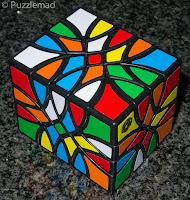 Now I know that a large majority of you readers of my blog just won't or don't do twisty puzzles but DON'T click away just yet.....these are twisties that everyone can do - there are no complex algorithms at all. These can be solved by intuition after you notice just a couple of very interesting features. 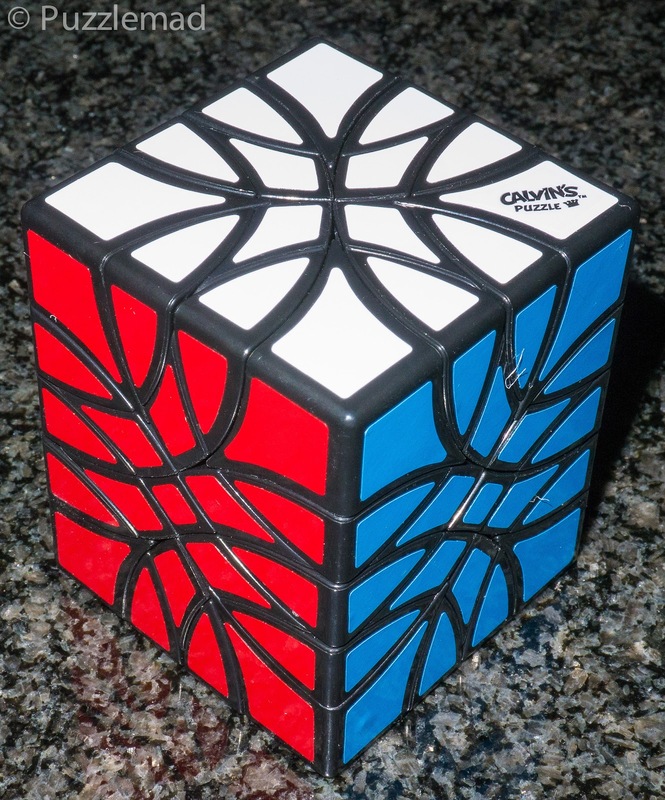 How does one go about solving a completely new twisty? 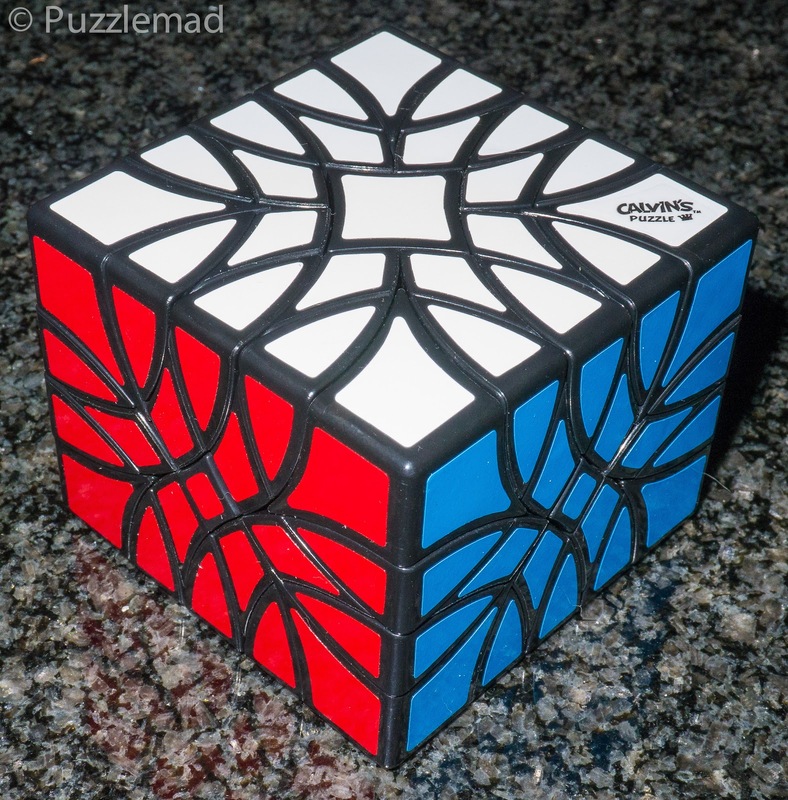 Usually I would start by trying out some of my cube and cuboid algorithms on the new puzzle to see what happens and then reverse it before trying something new. 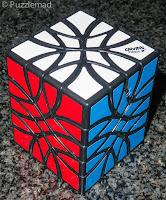 But these don't work like a normal cube/cuboid....the faces don't turn. 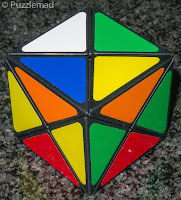 I was slightly horrified when a friend picked up one of these puzzles and tried very hard to turn a face! I thought he was going to break it when a horrible creaking noise happened but luckily after it wouldn't move he gave it back for me to show him. These puzzles, as you might guess from the pictures are corner turning puzzles - the pieces scramble because there is a 2 piece overlap on the 4x4 face and a 1 piece overlap on the 5x4 face. This enables all the pieces to be separated and to produce something truly pretty when it is scrambled as you can see. 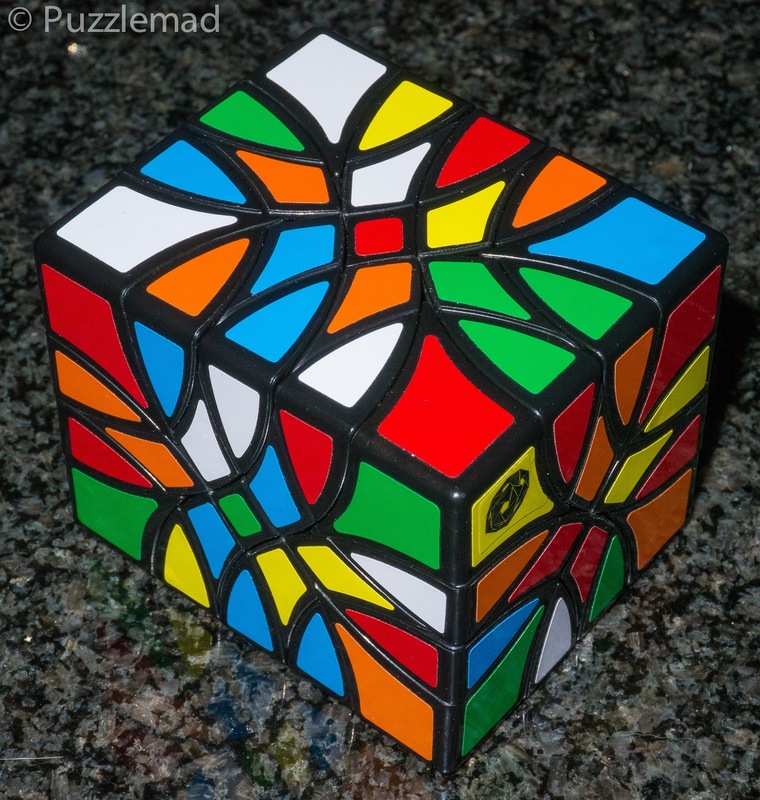 I did think to myself that if I couldn't solve it then it would at least be very pretty in the scrambled state. Having failed to try any normal algorithms I then went on to trying some standard up, up, down, down moves on adjacent corners to see what happened (this would be the equivalent of the "edge piece series" on a cube). On the left I did my up up down down on the 2 corners at then end of a long (5unit) edge and straight away we see that a piece has been isolated - the edge pieces have done a 3 cycle (r/w to b/r to r/y and so on). This is very useful - it means that pretty much any edge piece can be moved where you want it if you can carry out setup moves and then undo them. On the right we haven't managed to isolate any single piece but notice that the inner face pieces have been moved. Each of those face pieces are paired to the adjacent colour (above r/g is actually a single piece). If you just concentrate on the face piece pairs then we have done another 3 cycle (b/r to r/w to r/g and so on). The result of this is that we have found a way to move the face pieces wherever they need to be as long as we can ignore the edges. I can hear your penny dropping as you digest the implication of this....we can just use the 4 edge urns first to move the face pieces into position without worrying about edges and then once all the face pieces are in then we can swap to different corners to move the edge pieces without breaking up the work we had already done. Easy peasy I can hear you mutter! I do have an odd tendency to hear your voices.....other voices tell me I'm not mad! 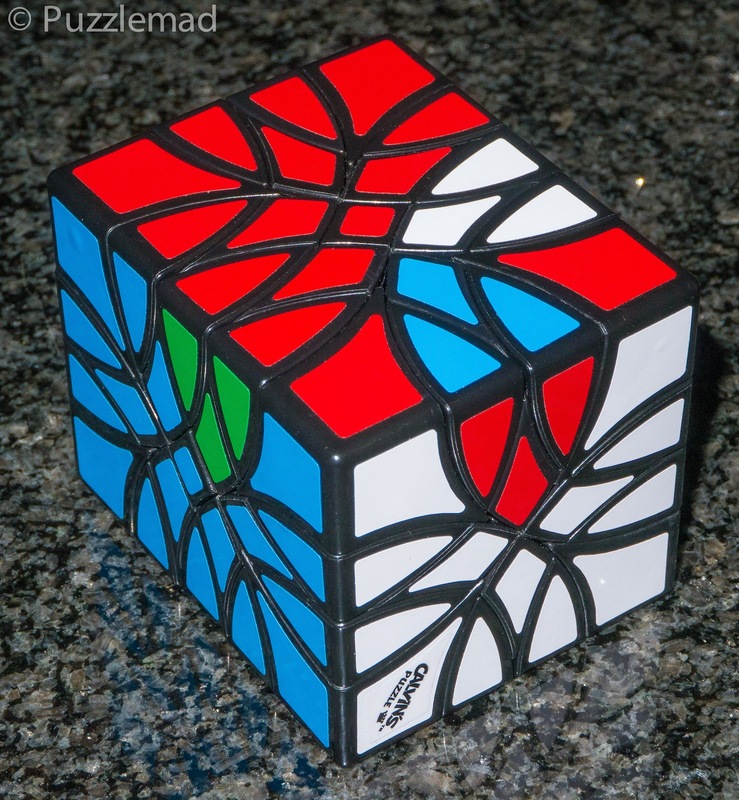 Everything got solved and all of a sudden I noticed that just 2 pieces needed to be swapped. How??? 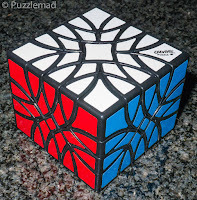 Many of you who have followed my ramblings for years will be vaguely aware of the "law of the cube" which says that swapping just 2 pieces is mathematically and physically impossible. But looking above, I definitely need to swap 2 pieces. 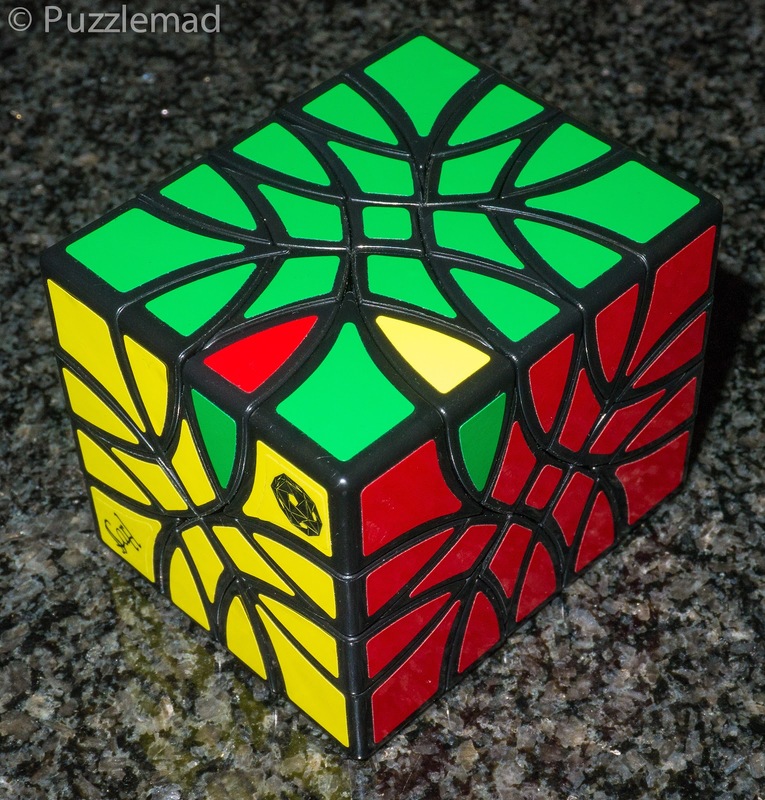 I discussed the cause of this before (here and here) in the context of other puzzles. 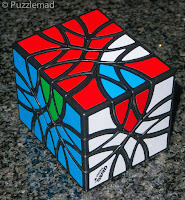 The law of the cube holds - there MUST be a third piece that needs to be swapped. The false equivocation here is that there are 2 edge pieces that look identical but are effectively different and have set positions). In the example above the red/green edges are interchangeable so my 3 cycle needs to be insitu r/g to correct r/g position, g/y to it's correct position and then the out of place r/g to the currently filled r/g slot. This can be done either in a single go with some very complex setup moves or can be done piecemeal. 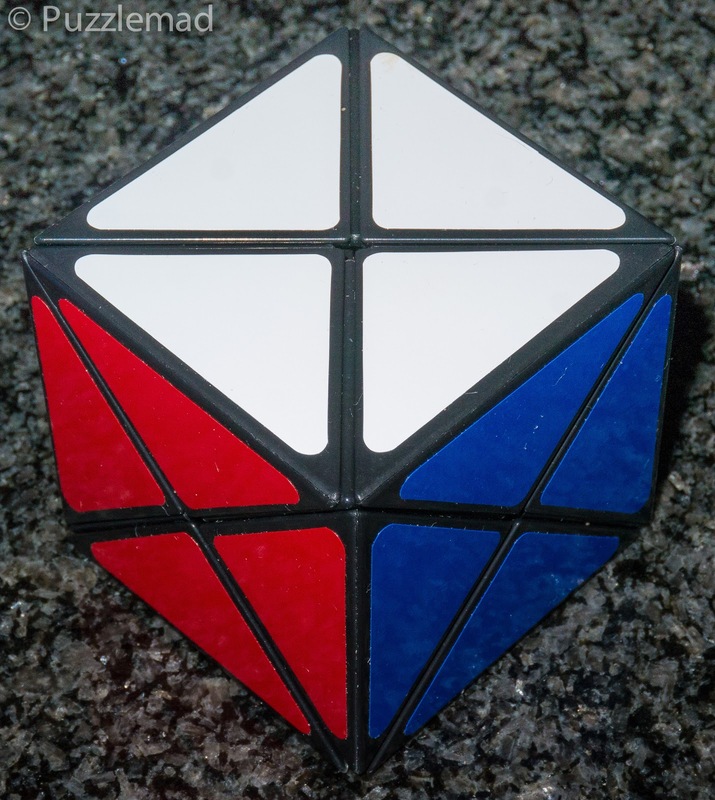 This is the most fun part of the puzzle - the end game is great fun! 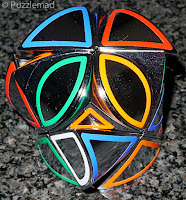 Again I did my initial casual exploration and realised that even though there are many more of the face pieces, they all have to remain in very set orbits and cannot stray out of them to other parts of the cube. 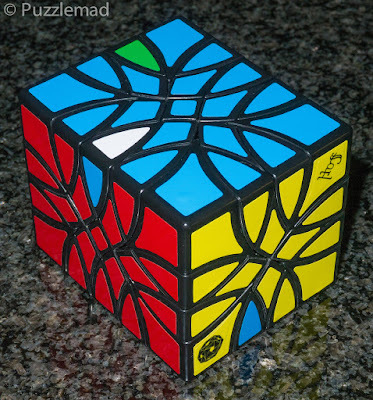 The same 4 move algorithm on each end of a 4 edge could manipulate them. Placement of all the face pieces took me only 5 minutes. What about the edges? 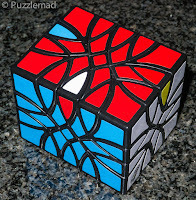 Exactly the same.....moves at each end of a 5 edge interchanged 3 edges. It was game on. No fancy algorithms but lots and lots of setup moves and I had it solved. I have done the 554 about a dozen times and for some reason have never produced a parity situation. I am reliably informed that it is possible but I have never seen it. I cannot understand why as I don't do anything in particular to avoid it. The 445 is a much less arduous puzzle but I produce the parity pretty much every single scramble. 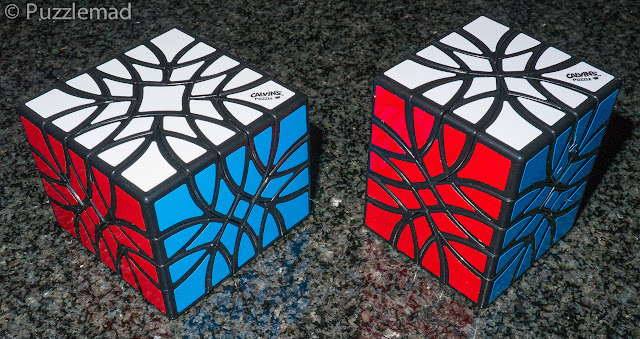 Both puzzles are well worth getting for your collection - they look great solved or scrambled and they are genuinely a puzzle that anyone can solve by intuition alone. 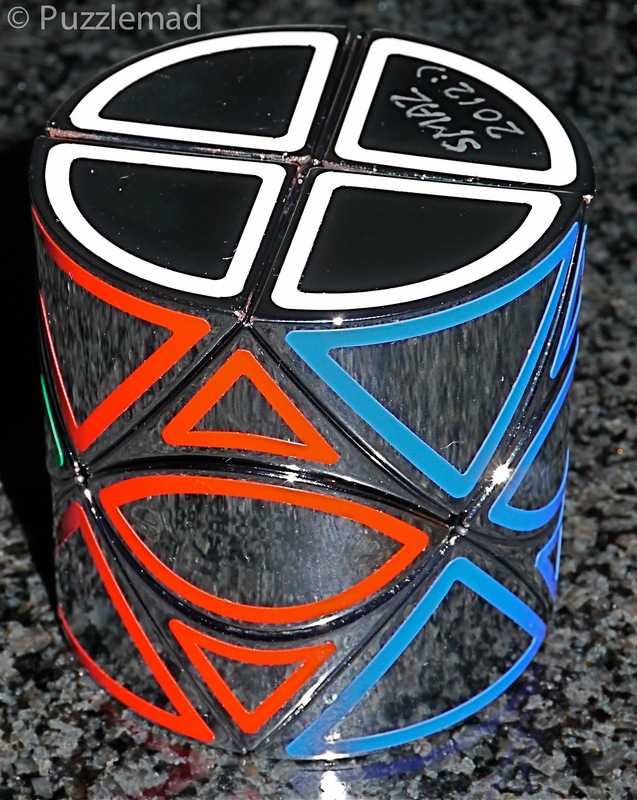 So whilst you are buying the 2 bubbloids from Marty then I suggest you also get one of these from him to warm yourself up on intuitive solving processes. It's just a Dino cube!!! I guess that the dino barrel is no longer an intuitive puzzle! 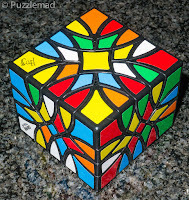 I hope you enjoyed this - I lurve the twisty puzzles but am aware that many of you don't because you cannot remember algorithms but with many puzzles it is possible to solve by intuition alone with no real algorithm knowledge at all. These are nice challenges and are open to all solvers once they have lost their fear of them. 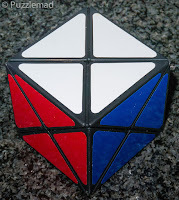 Keep an eye on my YouTube channel - I will soon be posting the solutions to some of the recent disentanglement puzzles. The aim is not to give things away but primarily to help people who have dismantled something but cannot get them back together again. I will try to get a video done for you. But.... it has been a rather long time since I have done this puzzle and I probably don't remember how AND I am pretty busy the next few weeks. If I've not done it within a month then drop me a reminder via my contact page and I'll try harder.